Glass shards lay scattered on the ground in front of a large chain store on Ste-Catherine Street West. A young punk, his face covered with a black bandana, screams at a line of riot police. Molotov cocktails and rocks fly through the air. Anarchism, the belief that formal government is unnecessary and therefore illegitimate, has deep roots in Montreal’s communities, from factories to academic institutions like Concordia. “No gods, No masters, No bosses, No borders” is a typical anarchist cry which encompasses the “freedom-loving” ideology. But while anarchists have a reputation for standing on a soapbox, they can be found to effect change through action. “There are a lot of myths around anarchism,” explained Sebastien Thibeault, a member of anarchist federation l’Union communiste libertaire. “One of the more persistent myths is that anarchism is only a subculture. Testament to the growing anarchist culture in Montreal, thousands of people converge in a modest community centre in the South West neighbourhood of Little Burgundy every May for the Montreal Anarchist Bookfair. It is a colourful gathering of hard-line anarchists, zine-makers, student activists, community organizations and many who are just curious about anarchism and what it stands for. This year marks the 11th running of the book fair, which will take place over two days from May 29 to 30. “That the anarchist book fair has not only lasted for 10 years, but grown tremendously, is a testament to the need to carve out our own niches and a testament to the commitment of anarchists and non-anarchists who have critiques of the current global system [and want] to look for better [alternatives],” said Amanda Dorter, a member of the book fair’s organizing collective. More than simply a space for independent anarchist publishers to sell their books and magazines, the book fair is a multi-day festival that includes workshops, activities for kids, art exhibitions and concerts. In past years, organizers estimated it has drawn over 5,000 people and tout it as the largest anarchist event in North America. According to Houle-Courcelle’s book, these immigrant anarchists set up bookstores and publishing offices downtown, mostly around the corner of St-Laurent Boulevard and Ste-Catherine Street, in what has become the gritty Lower Main district. These would-be revolutionaries were poor workers who rallied behind the the creation of labour unions, particularly for factory workers in Montreal’s women’s garment district. Despite Montreal’s vibrant history of anarchism, one would be hard pressed to find many long-standing anarchist organizations, or many anarchist activists over the age of 30. In the movement today, a common term is “activist burnout,” a tipping point that traditionally comes after years of criminal charges, long meetings, too many beatings from the police or simply the stress of being involved in day-to-day solidarity work. Thibeault suggested that the longevity of the Montreal Anarchist Bookfair is a sign that the stereotypical flash-in-the-pan style of anarchism is fading. Kruzynski was involved in a large anarchist initiative called the Autonomous Social Centre, which tried to squat in an abandoned building in Pointe-St-Charles last May. The goal of the squat-in was to petition for the building of a multi-use community centre in the neighbourhood. Rooted within the walls of Concordia University, part of Kruzynski’s research on anarchism includes work she does with the Collective for Research on Collective Autonomy, a group which conducts research on anti-authoritarian, pro-feminist movements across Quebec. Houle-Courcelles agreed that anarchist publishing has greatly contributed to this demystification of the movement. 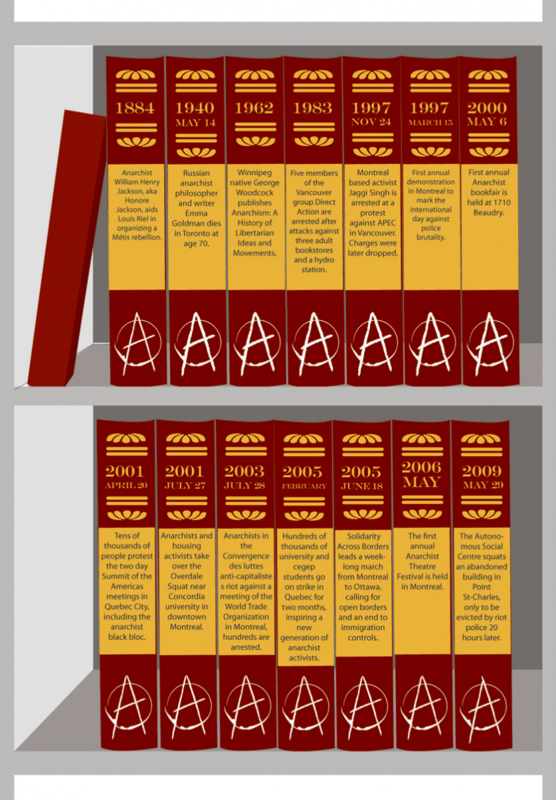 Through an increased access to publishing and no shortage of websites and blogs on the subject, anarchists have been able to put their ideas out to the world and get around the stereotype that anarchism only stands for chaos and violence. “Over the last 15 years, the many books which have been written about anarchism in Quebec have fleshed out the ideology a bit, and has allowed people to see that anarchism doesn’t limit itself to the existing prejudices against it,” said Houle-Courcelles. Anarchists aren’t the only ones on the radical left who are engaged in publishing and book distribution in Montreal. Last March, the Revolutionary Communist Party, a Marxist-Leninist-Maoist group, opened up a bookstore called the Maison Norman Bethune near Frontenac Metro. While their bookshop stands in contrast to the anarchist bookshop l’Insoumise on St-Laurent Boulevard, RCP member Jacques Beaudoin insists that the Maison Norman Bethune isn’t trying to compete with anarchist publishing. Meanwhile, organizers of the Montreal Anarchist Bookfair are already gearing up for the 2010 edition of their event. While the thought of a building full of punks and counter-culture radicals might be off-putting to some, Dorter encourages everyone to come out to this year’s book fair whether anarchist or otherwise. “There really is something for everyone here. We live in a place where cops racially profile and kill people with impunity, where migrants are being deported at increasingly alarming rates and where layoffs and cuts to benefits are causing greater poverty and insecurity for regular people,” said Dorter. The Montreal Anarchist Bookfair will take place at the CEDA centre (2515 Delisle St.) from May 29 to 30, and will be preceded by the Festival of Anarchy during the entire month of May.